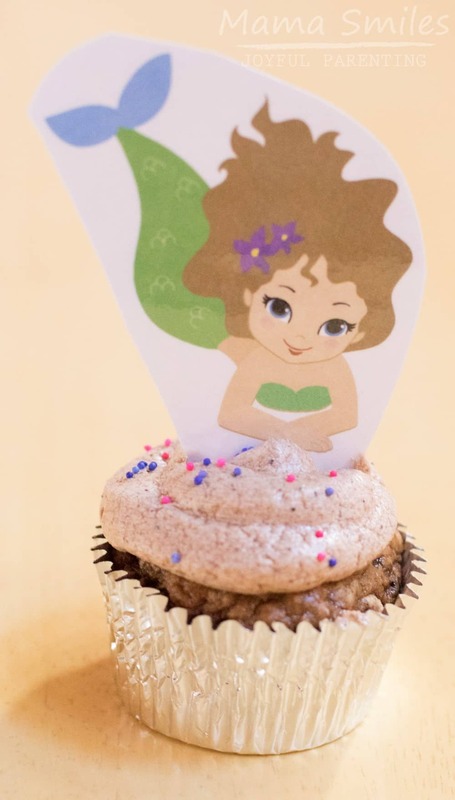 Simple but fun ideas for a mermaid birthday party for a five-year-old. 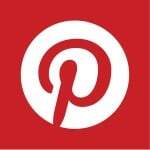 Easy activities and fun cupcakes! Also a great cake idea! I can’t believe that my youngest child is five years old! Anna wanted a mermaid themed birthday party this year. She made lots of fancy plans, including a request for this mermaid cake. We were in the middle of getting our condo ready to sell, and I had two extra teenagers living in my house. We didn’t make the cake, but I did manage several of her other requests, starting with this welcome sign. The cinema lightbox is the same one we used for Emma’s Harry Potter birthday party. It’s a great way to fancify any day or event! Instead of a mermaid cake, Anna got chocolate cupcakes (we used this recipe with cup 4 cup flour to make them gluten free). Anna picked out “fancy” foil cupcake cups. I got the mermaid pictures off of depositphotos and laminated them. Our laminator died after a long life; this new AmazonBasics laminator works well as a replacement. I keeps birthday parties stress free by dividing activities into stations. Kids can rotate between stations as quickly or slowly as they like. At the first station, kids decorated canvas bags and tiny fairy doors. The fairy doors were actually purchased for Lily’s fairy themed birthday party that took place two days later (post coming soon). We had enough for Anna’s party, and I thought the kids would enjoy them. 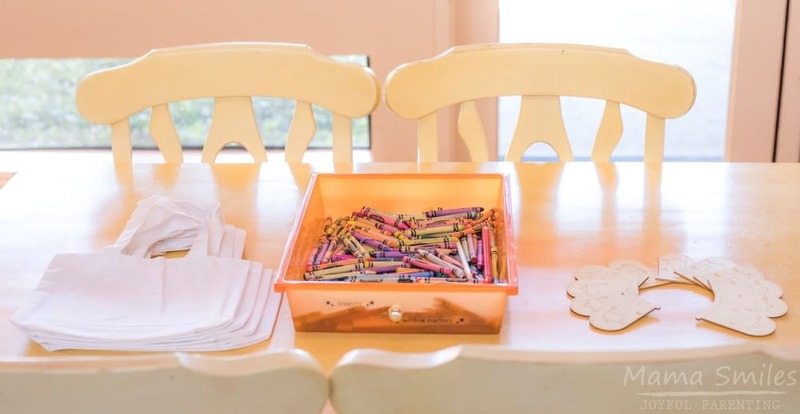 My kids LOVE crafts, but it isn’t the top activity choice for all of their friends. 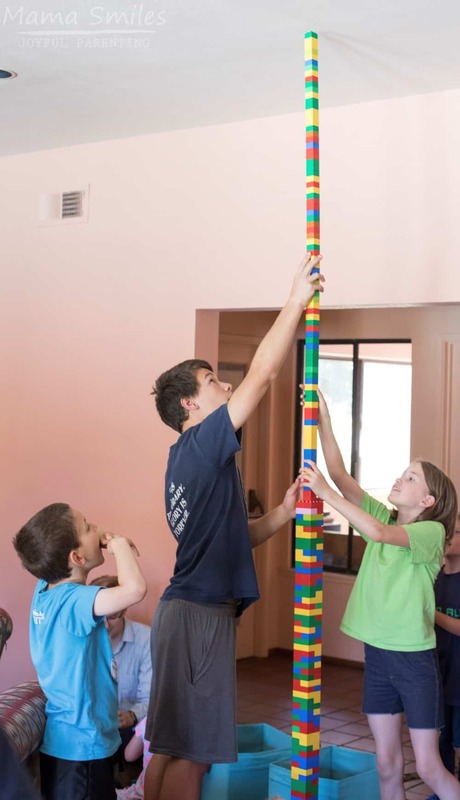 Building a tall tower is a great ice breaker party activity that often intrigues the kids who aren’t thrilled at the idea of making a bunch of crafts. Slime making was our central party activity. I used our standard gak recipe (equal parts glue, water, and liquid starch), with clear Elmer’s glue instead of the white stuff. Note: Elmer’s school glue is non-toxic, and the liquid starch I used has no anticipated adverse effects from ingestion (that is why I used it instead of Borax, which is another popular Gak/slime ingredient), but neither is intended for eating. No adverse effects primarily means it isn’t likely to permanently harm you; it could make you feel quite sick in the short term. Borax is used to make liquid starch, but making the starch changes the chemical structure, making it safer. 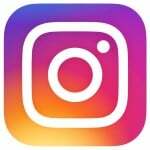 Borax is also used to make contact solution, which you may have seen as an ingredient in other slime recipes. I did all of the ingredient measuring for this activity, and the kids used craft sticks to stir until the slime was set. Parents were asked to always supervise their children’s play with the finished product. If you have a child who is likely to put things in their mouth, I recommend the edible gak recipe from Asia Citro’s book, 150+ Screen-Free Activities for Kids. 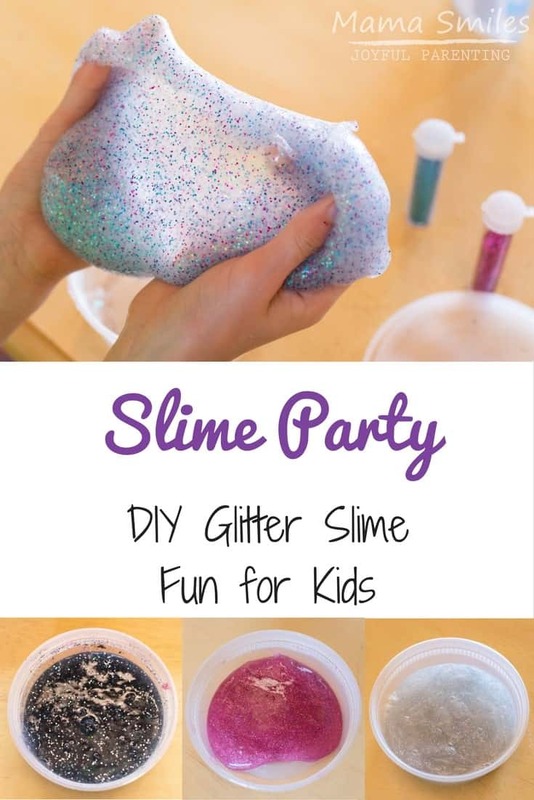 We used a whole bunch of glitter that Craft Project Ideas sent us ages ago to make the slime at Anna’s birthday party. I was amazed at all of the different colors the kids came up with, using only glitter to color the slime! These deli containers were perfect for sending slime home at the end of the day. Anna’s party may be over, but she remains mermaid obsessed! 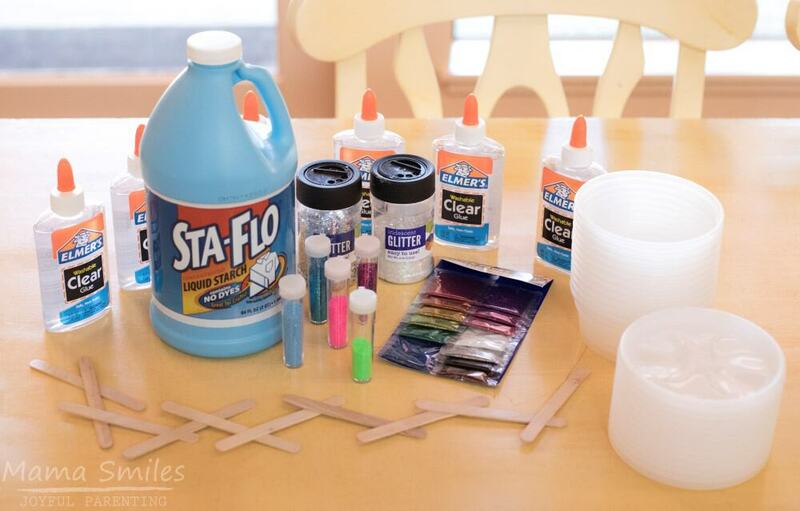 Do you have a fun mermaid-themed activity for her to try? Please leave any mermaid activity ideas in the comments. 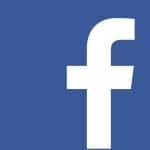 You can also drop a note on my Facebook page, or tag me on Twitter or Instagram. What a fun party! 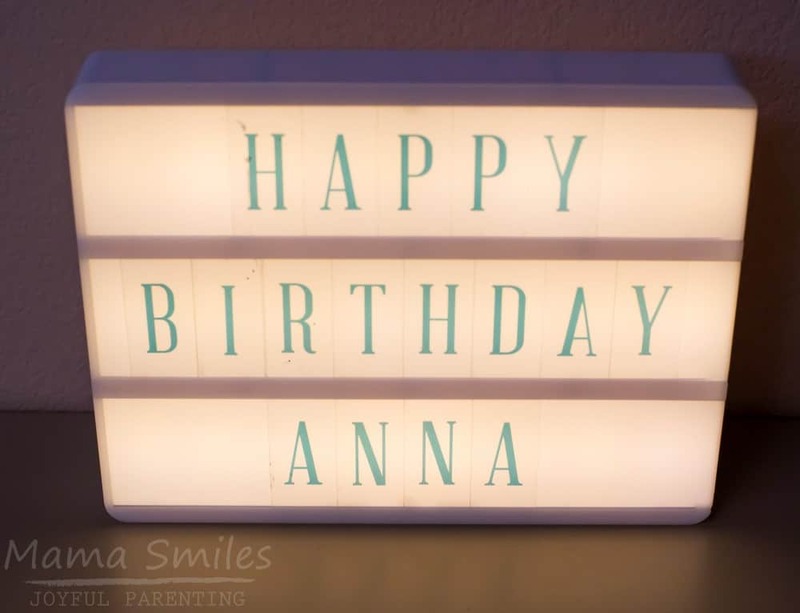 Happy 5th birthday to Anna! Ha ha ha, I had to laugh at your disclaimer for the slime. I love those fairy doors. Love how your slime turned out! I didn’t realize Elmers comes in clear! The clear Elmer’s glue makes wonderful slime.